If you could stand on Mars and watch Phobos passing overhead, you would notice that this moon appears to be only about half the size of what Earth's Moon looks like when viewed from the ground. In addition, the Sun would seem to have shrunk to about 2/3 of its size as seen from Earth. Martian eclipses are therefore dark but not as spectacular as total solar eclipses on Earth can be. In compensation, the martian eclipses are thousands of times more common, occuring a few times a day somewhere on Mars whenever Phobos passes over the planet's sunlit side. 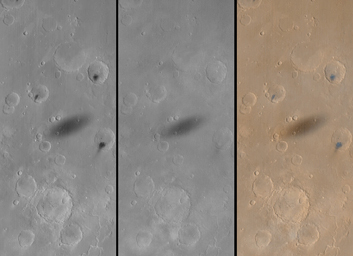 Due to the changing geometry of the MGS orbit relative to that of Phobos, the shadow is actually seen in MOC global map images (like in B, above) about a dozen times a month.